Flowers of the blue poppy, Meconopsis Fertile Seed Group. 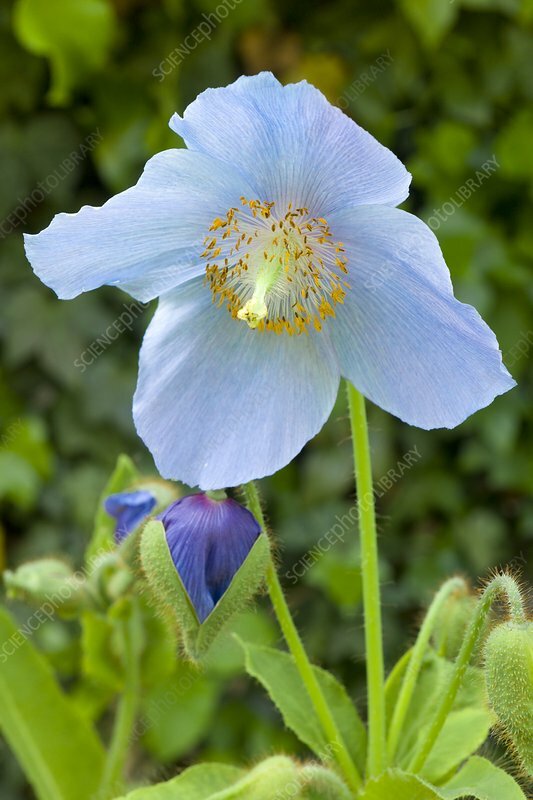 Originally introduced from W China in 1924 as Meconopsis betonicifolia, many named varieties of blue poppy were raised by hybridisation with M. grandis. Meconopsis flowers are attractive to bees, and open cross pollination is common. As a result, the correct naming of varieties is now very uncertain. The name Fertile Seed Group has been recommended for all seed-raised blue poppies in recognition of this. The picture shows an open flower of a seed-raised open pollinated plant of Fertile Seed Group. The blue colours of the petals are quite variable, with deeper and greener hues most prized. The plant in the picture is typical of many garden forms; the colour perhaps pale, and with a purplish hue, particularly evident in the bud (below flower to left).